Carlos Menchaca-District 38-Sunset Park, Red Hook, Greenwood Heights, Borough Park, Windsor Terrace and Bay Ridge Towers. 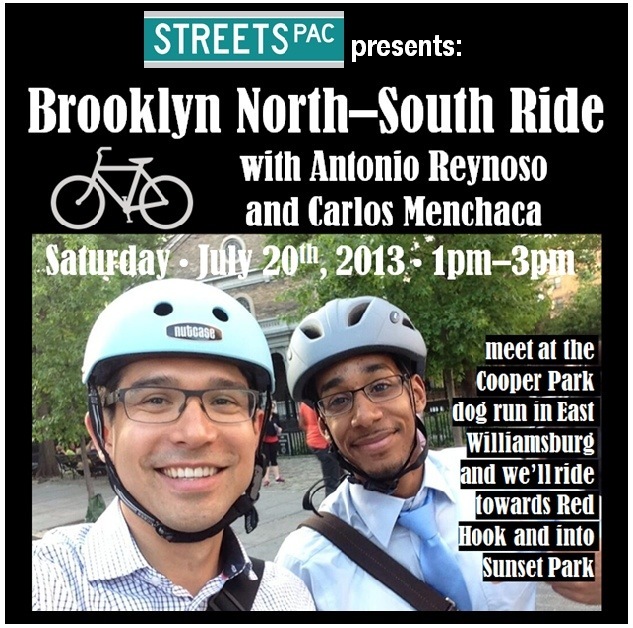 Join StreetsPAC and our first round Brooklyn endorsees, Antonio Reynoso and Carlos Menchaca, for a ride between their two districts. We’ll start at the dog run in Cooper Park in East Williamsburg, cycle through Bushwick, Prospect Heights, Park Slope, and Red Hook, and then finish at the top of the hill in Sunset Park. The 15 mile route runs the gamut of bicycle infrastructure from non-existent lanes we’d like to see created to hard-fought protected ones already installed like Prospect Park West. Several brief stops along the way will allow our candidates to speak directly about street safety issues they are championing in their district. A ride down Morgan Ave and into Bushwick will let Antonio speak on the need for improved truck route calming and enforcement, while the ride between Red Hook and Sunset Park allows Carlos to highlight the disconnected streetscape in his district as well as the underused public space below the BQE at Third Avenue. Please RSVP to info@streetspac.org to join us in bringing attention to the work that still needs to be done in improving Brookyln’s streets. Refreshments will be provided at the Sunset Park finish.